While I am a big fan of the technology and sheet ability of the Nissan GT-R, I have to say that for me the styling is definitely function over form. Call me a Ferrari lover all you want, but there is something uniquely challenging about the GT-R’s shape. And I don’t think I am necessarily the only one out there. 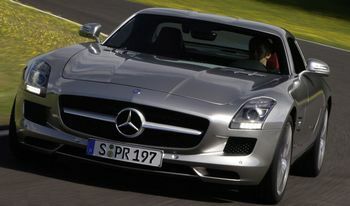 So let’s just say I was surprised when Mercedes decided that cross-breeding the late 50s / early 60s classic gull wing SL with the GT-R was the way to go with the metal work for their new Mercedes AMG SLS. It looks like the GT-R gulped down the gull wing and got indigestion for its trouble. Check out the head lights in particular. GT-Rs are very common in the Japanese used car auctions and readily buyable.